It’s a Beach Escape at City Square Mall! Soak in the sandsational lineup of activities and promotions with your family this June school holidays! From 27 May to 26 June 2016, pack your beach gears and head down to City Square Mall, to join in the celebrations at Barney’s Beach Party, and partake in your favourite seaside activities at City Green (Outdoor Park). Back by popular demand, everyone’s favourite purple dinosaur Barney is returning for its fourth musical celebration at City Square Mall. 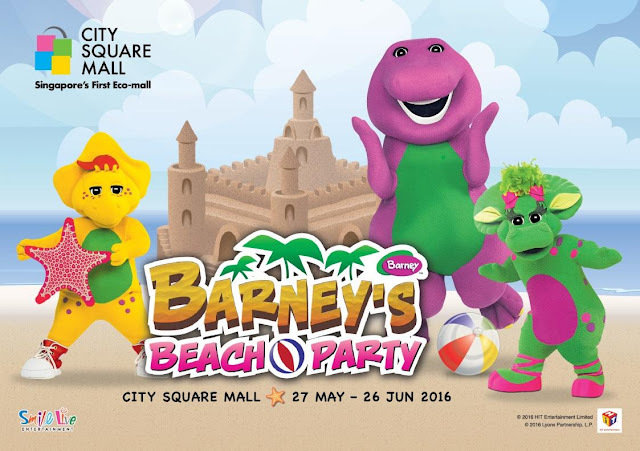 Groove along to new beats with Barney, BJ and Baby Bop at ‘Barney’s Beach Party’, a fun, educational and upbeat live show featuring a collection of your favourite tunes with a new summer twist. The City Green outdoor park will be transformed into an urban beach setting, where there will be a variety of beach-themed activity stations, with something for everyone in the family. Get to test your Frisbee throwing and surf skills, build your very own sandcastle at the sand play pen and splash your way through the water with the Bumper Boats. Feast your eyes on and get your camera ready too for a snapshot with the wondrous Spectacular Sandcastle that will be on display in front of the Mall. This Great Singapore Sale, shoppers can enjoy a sea of promotions at City Square Mall. With every $200 ($300 with NTUC receipts) spent, patrons can redeem a Beach Survival Set consisting of a beach mat and 12can cooler bag, essential for a trip to the beach. Additionally, with the purchase of $50 worth of City Square Mall vouchers, patrons of the mall will receive a complimentary $5 voucher. Barney is returning to City Square Mall for his fourth show! Join Barney, BJ, and Baby Bop in this upbeat ‘live’ programme, and dance and sing along to all time favourites with a fresh summer twist. Shoppers can also redeem a Meet & Greet pass 1 hour before each show to take a family photo with the adorable purple dinosaur himself with a minimum of $50 spent. Hurry though, as there are only 50 passes per show (available between 4 – 19 June 2016, daily except Mondays). Marvel at this glorious structure made by a team of professional sand sculptors. Prepare your cameras for this unique photo opportunity! fun. Try your hands at Sand Bowling, test your surf skills at the Mechanical Surfboard or build the fort of your dreams in the Sand Play Pen. Look out for other activities such as Bumper Boats, Frisbee Throw and Inflatable Rock Climb. Come on down for a fun family day out! With $200* (or $300* with NTUC FairPrice receipts) spent, shoppers will receive a Beach Survival Set consisting of a 12can cooler bag for their beverages as well as a beach mat which comes along with an inflatable pillow. Grab yours quickly though, as there are only 4,000 sets available. 1. Maximum of 3 same day combined receipts from any store except from the purchase of City Square Mall/outlet’s gift vouchers, Golden Village Quick Tix TM , SISTIC tickets, Singapore Post, banks, pushcarts, non City Square Mall outlets’ atrium events and purchase/topping up of stored value cards. 2. Redemptions must be made on the same day of purchase at the L2 Customer Service Counter. 3. Redemptions are on a first-come-first-served basis and while stocks last. 4. Receipts used to redeem for the $5 City Square Mall voucher cannot be reused for Meet & Greet pass redemption, regardless of total amount spent. City Square Mall is directly connected to Farrer Park MRT station (NE8) with over 200 retail, dining and lifestyle options such as Best Denki, Daiso, NTUC FairPrice, Food Republic, Golden Village, Celebrity Fitness, Toys‘R’Us and Uniqlo. As a family-friendly mall, there are many facilities available for everyone in the family, including spacious corridors, nursing rooms, free rental of kiddy carts and wheelchairs. City Square Mall is the first and only shopping mall in Singapore awarded the prestigious Excellence Awards (Shopping Mall Category) in the Businesses for Families Council’s ‘We Welcome Families’ consecutively in 2011 and 2013. The mall also garnered top accolades at the AsiaOne People’s Choice 2014, namely the Best Shopping Centre (Suburbs) and Top 3 Best Family-Friendly Mall. Now we know there are many Barney fans out there, so the good people at City Square Mall had generously given me 5 Meet & Greet tickets to host a giveaway. How to Enter : Please answer 2 questions by commenting on blog post and also by using the Rafflecopter widget below. Disclaimer : We were invited by City Square Mall to host this giveaway, no compensation were received. All photos in this post are provided and belongs to City Square Mall. My little girl grew up watching Barney and friends on TV and DVDs. She loves singing and dancing alobg with Barney and she could sing every single song. Until today she still love this huge and friendly purple dinosaur very much because it never fail to put a smile on each and every child faces. What I like about Barney and friends is that it teaches kids good social values and manners. Like saying please and thank you in our daily life. Barney is a kind and cheerful who always encourage children to use their own imaginations. It brings kids so much love which I think why every kids love him! I would say it is an educational and good role model show for kids. Hope to be bless and win the passes for my daughter. Thank you for this giveaway. My 2 years old toddler loves the purple & green dinosaur Barney TTM ! Even though he's a T-rex but his friendly , optimistic attitude catches every kid's heart . He conveys educational messages through songs & small dance routines . All his songs / dance movements are so catchy & easy to remember , especially ' I Love You ' song ! Hope to win for my baby girl ! We love Barneh because he teaches us to love and share! It's very important for young children to understand the good values of loving everyone!! There are some values that Barney teaches. He emphasises the importance of family, love and mannerisms. He cultivates passion and acceptance. He likes ideas, imagination and guesses from preschool children. He could educate his teachings in simple songs to remember by kids and easily pickup by adults too (so that patents could sing with their kids). He's such a lovely Dino!! The Barney soft toy is a staple on our bed and accompanies the little one to bed every night. The purple dino also thought him so much about sharing and caring and everything else so positively and cheerily, in the much loved song and dance way. Especially cleaning up his toys or after a meal! We only have to start singing "clean up clean up, everybody do your share..." And the little one automatically chips in to clear away his toys, clean the table after a meal, etc! Hi, My son & daughters love barney since young. Barney teaches children are in song. When a child sings something, he tends to remember it better, he also teaches through love and acceptance. The most important is, my 3 children learn something good. I son love Barney's he use to have a toy Barney's than he is 4 but i look is old and dirty so i throw it always, that make him sad. Now have a chance ro see Barney hope to w8 n for him. Thanks for the giveaway for all the fanatics show for all children on this June School Holiday. Wish to win for my 2 lovely kids for this school holiday as they no plan where to go. Barney Purple Dino is their fav all the long since day one. hope to be the lucky one to win for them. My kids love Barney as it teaches them the value of love, care and share. They love all the songs and the activity. Hope to win the meet and greet season for a close up with Barney and Friends. My daughter's first love is Barney! I think that the show is not too bad as it teaches about relationships to my child through songs and make-believe games. Rainy Daz, Keep yourself dry, stay indoor & start moving our fingers.